Mike Ragogna: Roger, hi. Didn't you just play the at the Olympics? Roger Taylor: Yeah, we played one of the concerts associated with the Olympics in Hyde Park. MR: You almost can't get a gig like that except for maybe playing for the world with Live Aid? RT: Yeah, we did the original Live Aid, which, to this day, I think is still the best event concert that's ever been. It was incredible, a little scary. "Okay, are you guys ready?" There are a hundred thousand people in the stadium, there's a billion people watching live worldwide, on you go!" It's scary, but we made it and it was a great event to be at. MR: Nice, no pressure there. RT: No pressure there, none at all! Just don't drop your drumstick. MR: Roger, Duran Duran has been a favorite band for so many people for so long. 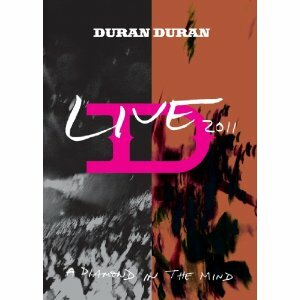 You guys have hung in there, releasing many albums featuring pop classics, many of them appearing on your A Diamond In The Mind: Live 2011 DVD. It was filmed at the MEN Arena in Manchester on December 16th of last year? MR: And it was during your All You Need Is Now tour. When you're playing the hits, do you try to update the old songs? RT: We sometimes do slightly different arrangements of the older songs. Like "Girls On Film" has a standard middle now and a slightly different end. Generally, people like to hear those songs as they were recorded. Of course, we still have four of the original members that recorded those songs. It's pretty easy for us to recreate those songs as they were recorded. We also have additional musicians. We have Dom Brown who is a great guitar player. We have an additional saxophonist and percussionist and backing vocalists. It's great that we have the original four members. People love to hear those songs as they were written. It's been quite easy to integrate the new songs into the show because the All You Need Is Now album is all about going back to that original, classic sound. The producer, Mark Ronson, led this band to rediscovering that sound. The whole show is very integrated very well on this tour. MR: You can tell, especially on new songs like "Girl Panic" or "Man Who Stole A Leopard." They hearken back to the original days of Duran Duran. RT: Yeah, Mark would come in and we would try to figure out a song or groove and it's, "Just think of the 'Girls on Film' groove. It's like, "Yeah, you own that groove. Why don't you use it again?" That was the inspiration for "Girl Panic." To use that with the "..Film" groove again. MR: That's different from the approach you took on recent albums. RT: We've spent a lot of time moving away from our sound. The last album we did was with Timbaland; Justin Timberlake came in and helped. We were trying to go in a different direction, but Mark Ronson said, "No, just be true to yourself. You're great at that sound." It was a great thing to have someone with that vision come into the project. MR: Yeah, one thing I notice with some bands is that when try to upgrade or update their sound or style, it seems forced. I mean, it's fun to hear them in a modern context, but usually, things work best when a band remembers the essence of what they are. It's got to be satisfying to know that the essence of Duran Duran is what people still really want. RT: Yeah, it's a fine line, you don't want to be a pale imitation of yourself. You don't want to be creating exactly what you were creating in the early eighties. You have to have some contemporary spin on the sound, and Mark Ronson came in with that. He just won a Grammy. He worked with Amy Winehouse. He came in with that real hip contemporary thing about him and that was thrown into the mix. He created something that was very unique and very 2011. MR: Yeah, I agree with you, totally. My point is that it relied on the basics, the truth of what Duran Duran is really about at the heart. RT: Exactly, exactly, which was the interaction between us as musicians. The great thing about Duran Duran in its early days is that everybody knew that John Taylor was the bass player and they could hear that he was playing on the record. I had a strong identity on the early records. Nick Rhodes also. It was great that he brought that back into the sound. MR: Mark said that you own that groove, which bring up an interesting point. Over the years, you've introduced another signature song, a cover of Grandmaster Flash's "White Lines," and many people now associate it with Duran Duran. MR: Frankie Goes To Hollywood's "Relax" is another one. RT: Yeah, I was about to say that's the only cover version. We have integrated "Relax" into our set, which was kind of like a homage to where "Wild Boys" came from. John and I were standing in a discotheque in Germany in the early eighties. We heard this song come on, "Relax" by Frankie Goes to Hollywood. It's a real stomp-driving, bass drum groove. We thought we had the right song for that. We went into the rehearsal room and that song was a real inspiration. "Wild Boys" took on a real life of its own. The seeds of that song came from a nightclub in Germany. MR: Do you have any other songs with stories like that? Were any other Duran Duran songs inspired in that way? RT: I can't think of any others that were strongly inspired. In the early days, we were very influenced by David Bowie and Roxy Music. There was a band in the UK called Japan that used sequences in their songs. We're also fans of Ultravox and Kraftwerk. But then, Andy Taylor was a fan of AC/DC and all these different influences were coming into the studio. Somehow, it had its own life. It became very unique in itself. It was influenced by a lot of different people. MR: Let's flip it around. People were very influenced by Duran Duran, especially your videos. Those were some of the most elegant and beautiful videos ever. RT: I know, I know. It's incredible. I can probably go to any hotel in the world and turn on one of the music channels and see "Hungry Like The Wolf" or whatever. It's incredible. We never knew the importance of these little clips. They were just the new promotional device. We didn't want to be film stars. We wanted to be musicians. We wanted to write songs. We wanted to play concerts. Somebody came up with the idea of these on location videos, which we were willing to do, but had no idea of the importance of them. We're very grateful for those videos. They turned us into international stars. They broke America for us, it was a real lucky break for us. MR: Yeah, you conquered the US, not only musically, but visually, as well as the rest of the world. RT: Yeah, you've always got to be at the right place at the right time. We were exactly in the right place. MTV was just starting up, it was being piped into millions of homes in America, and we just happened to be the band with the right look and the right sound making these mini movies. If it would've come five years earlier, who knows. A lot of it was being in the right place at the right time and being open. We were very open to new ideas. There were a lot of bands who were refusing to do videos because it wasn't rock 'n' roll or it wasn't truly a band thing to do. We were very open minded and it worked for us. MR: I also want to throw out there that you all were a young and a beautiful band. RT: We always had the aesthetic quality, we say. You had to be a good musician to be in the band, but you also had to have a look about you, and I think that served us well in the end, although there was a point where we went down the teen route and thought, "Is this really where we want to be?" Again, it served us well in the end. It got us noticed. We took great comfort in the fact that The Beatles also went through this teen thing, but they were eventually taken seriously and made great albums. We used to look up to The Beatles and said it's okay because they had the teen thing--not that I would ever compare us to The Beatles because they are so unique and such a groundbreaking band. But we used to take comfort in the fact that they experienced the teen thing as well. MR: And, of course, following your teen idol period, you had more hits like "Come Undone" and "Ordinary World." You did what you needed to do. RT: Exactly, and we survived it. We survived 30 years now and we have more respect that we ever have. We get good reviews of our concerts now, which is... we never used to get that. Life is good. MR: Duran Duran and groups like you definitely contributed to pop culture--the music, the videos, the fashion. And I think that the reality is you all broke MTV, though it's perceived as the other way around. RT: Yeah, there weren't many videos out there. MR: There weren't very many, but you really set the tone for what was going to come down the pike for many years, so in that way, I think you play no small part in the culture of America and the world. MR: When you look back to those songs and your career, what are your thoughts? RT: I think that we really appreciated it. There was a time, I think, that we resented that we were famous for our videos. We were really resentful of that because we wanted to be taken seriously as a band and for our music and our songs. Luckily, time has been good to us. The songs have stood the test of time. We performed in Italy and there were 10,000 people there going crazy for the music and the songs and what we are now. We now accept that the importance of those videos was a great thing. We have total acceptance of that now, and that feels great. MR: Roger, it didn't make the album, but to be honest, my favorite track by the group is "Save A Prayer," and that video as well. It was a beautiful Duran Duran moment all around. RT: "Save A Prayer," wow. We played in Verona last and we came onto the encore with "Save A Prayer" and we actually didn't have to sing a word of the song. The audience sang every note, every word of the song. Yeah, thirty years later, that's still happening. It shows the strength of those songs. They weren't just about videos. The videos were amazing, they cemented the songs in people's minds, but we wrote good songs. We still get to play them now and to be able to get to play those songs that you've written is incredible. MR: "Save A Prayer," no play on the title here, comes off like a hymn when people sing it. I remember thinking that years ago when you guys played it in concert. RT: It was like a national anthem, actually in Italy. The two big songs there are "Save A Prayer" and "Wild Boys." They're almost apart of the culture identity of Italy. It's fantastic. MR: Roger, what advice do you have for new artists? RT: Of course, you would say something different now. We were lucky when we started. We came just after The Beatles and Queen and The Stones, bands that had this huge catalog of music and longevity. David Bowie was another one. There was a lot of money swinging around in the industry, so they signed a lot of different people and we were one of many acts that got signed to EMI that year. It was a land of opportunity at that point. Now, it's difficult. The advice is to just keep working it. Work hard. You have to work all the different mediums. My son's is in a band. He is also a DJ, a mixer, and a producer. I think you do have to diversify and work a lot harder, I think. MR: Social media as well. RT: Social media as well, which is another thing you have to work. MR: Yeah, you almost have to work, as the old phrase goes, as a one-man band. RT: You do. Unfortunately, I think it is a product of the illegal downloading. There's no money left in the industry and none to invest in new artists and bring talent on. I'm afraid we're at the point where the illegal downloading has brought us to, which is a tough point in the music industry. MR: Roger, thanks so much, I do really appreciate your time. RT: Thank you. It's a great thing you're doing there. Майк Рагонья: Роджер, привет! Вы, вроде бы, только что отыграли на Олимпийских играх? Роджер Тэйлор: Даа, мы отыграли в Гайд парке один из концертов, связанных с Олимпийскими играми. МР: Почти невозможно попасть на такое шоу в качестве участника, исключение составляет лишь ваше выступление на весь мир с Live Aid. РТ: Даа, мы играли на первом концерте Live Aid, который, я считаю, до сих пор является лучшим событием за всю историю музыкальных концертов. Это было невероятно! Немного страшновато, правда. «Хорошо, ребята, готовы?» На стадионе - сто тысяч человек, миллионы смотрят вживую по телевизору, поехали!». Было страшновато, но мы это сделали! Круто было быть частью такого события. МР: Здорово, давления не чувствовалось. РТ: Нет, вообще никакого давления!!! Просто не урони барабанную палочку. МР: Роджер, Дюран Дюран так долго были любимой группой для такого большого количества людей. Вы, ребята, тусуетесь в этом, выпуская множество альбомов, включающих поп-хиты, ставшие классикой, многие из которых включены в ваш DVD “A Diamond in the Mind: Live 2011”, который был снят на MEN Арене в Манчестере 16-го декабря прошлого года? МР: И это было во время вашего тура в поддержку альбома «All You Need Is Now». Когда вы исполняете хиты, стараетесь как-то усовершенствовать старые песни? РТ: Мы иногда делаем немного другие аранжировки старых песен. Например у песни "Girls On Film" сейчас стандартная середина и слегка другая концовка. В основном, люди хотят слышать эти песни в том виде, в котором они были записаны. Конечно же, в составе нашей группы до сих пор есть четыре первоначальных участника, которые эти песни и записывали. Нам довольно легко воссоздавать эти песни в том виде, в котором они были записаны. У нас также есть дополнительные музыканты. Дом Браун – замечательный гитарист. Также в нашем распоряжении есть дополнительные бэк-вокалисты, саксофонист и перкуссионист. Хорошо, что у нас есть четверо участников группы, которые играют в ней с самого начала. Людям нравится, чтобы песни звучали так, как они были задуманы авторами. Было довольно легко вставить новые песни в шоу, поскольку альбом All You Need Is Now – это возврат к первоначальному, классическому звучанию. Продюссер Марк Ронсон заставил группу заново открыть это звучание. Шоу очень качественное в этом турне и имеет законченный вид. МР: Да, пожалуй, особенно это чувствуется во время исполнения новых песен, таких как «Girl Panic» и “Man Who Stole A Leopard”. Они звучат как будто из тех дней, когда Дюран Дюран только начинали. РТ: Даа, бывало Марк заходил и мы начинали пробовать нащупать песню и «грув», и тогда он говорил: «Просто вспомните грув песни "Girls On Film". Это же ваш «грув», почему бы не использовать его ещё раз?» Вот таким было вдохновение для песни «Girl Panic», - использовать ещё раз грув из «Girls Оn Film». МР: Этот подход отличается от того, что был использован при создании предыдущего альбома. РТ: Мы провели много времени, отходя всё дальше и дальше от нашего звучания. Последний наш альбом был с Тимбалэндом, Джастин Тимберлэйк тоже помогал. Мы попытались пойти в другом направлении, но Марк Ронсон сказал: «Нет, просто будьте честны сами с собой. Вы достигли совершенства в своём звучании». И было очень здорово, что кто-то с таким видением вопроса принял участие в проекте. МР: Даа, я заметил одну вещь, когда некоторые группы пытаются модернизировать или усовершенствовать своё звучание, ощущается напряжение. Конечно, круто слышать их в современном контексте, но обычно получается лучше, если группа вспоминает сущность того, чем они являются. Должно быть приятно осознавать, что сущностью Дюран Дюран является как раз то, что до сих пор интересует людей. РТ: Даа, это тонкая грань, не хочется быть бледной копией самих себя. Не хочется создавать то же, что и мы создавали в начале восьмидесятых. Звучание должно быть современным, и Марк Ронсон как раз это и привнёс. Он только что выиграл Грэмми. Работал с Эми Уайнхаус. Есть в нём что-то такое настоящее, современное, хиповое, из чего вся каша и заварилась. Он создал нечто уникальное, звучащее так, как должны звучать вещи в 2011 году. МР: Даа, согласен с тобой, полностью. Я имею в виду, что это опирается на основы, на правду о том, чем на самом деле является Дюран Дюран в глубине души. РТ: Точно, точно, таковым и было взаимодействие нас, как музыкантов. Что было хорошо в начале существования Дюран Дюран, так это то, что все знали, что Джон Тэйлор играл на бас гитаре, и его можно услышать на записи. Меня тоже чётко идентифицировали с ранними записями. И Ника Роудса – также. Здорово, что Марк привнёс это всё обратно в наше звучание. МР: Марк сказал, что вам принадлежит этот «грув», и вот какая интересная вещь получается. Спустя годы, вы записали ещё одну знаковую песню: кавер-версию “White Lines” группы Грэндмастер Флэш, и теперь у многих эта композиция ассоциируется с Дюран Дюран. РТ: Ну, да… хотя это всё равно его песня, но конечно же Дюран Дюран постарались над ней в 90-е, и она стала главным элементом наших живых выступлений. Это захватывающая песня, одна из немногих кавер-версий, которые мы исполняем. Она до сих пор звучит очень круто. МР: Ещё одна - это “Relax” группы Фрэнки Гоуз Ту Холливуд. РТ: Даа, только хотел сказать, что это единственная кавер-версия. Мы встроили “Relax” в нашу программу в дань уважения к тому, откуда появилась на свет песня “Wild Boys”. Мы с Джоном стояли на дискотеке в Германии в начале 80-х. Услышали эту песню “Relax” группы Фрэнки Гоуз Ту Холливуд. Она прямо заставляла притопывать в такт ритм-секции. Мы подумали, что у нас есть подходящая песня с таким же «грувом». Когда пришли репетировать, поняли, что “Relax” действительно вдохновляет. “Wild Boys” зажила своей собственной жизнью, но корнями она уходит в ночной клуб в Германии. МР: У вас есть ещё песни с похожими историями? Какие-нибудь ещё песни Дюран Дюран были навеяны подобным образом? РТ: На ум не приходит ничего такого, что бы было вдохновлено так сильно. На раннем этапе на нас очень сильно повлияли Дэвид Боуи и Roxy Music. В Англии была такая группа Japan, которая использовала последовательности в своих песнях. Мы также очень любим Ultravox и Kraftwerk. А Энди Тэйлор был тогда фанатом AC/DC, и все эти различные влияния сходились в студии. Каким-то образом, теперь это живёт своей собственной жизнью. То, что мы делаем, стало уникальным само по себе. Очень многие оказали на это влияние. МР: Давайте посмотрим на это с другой стороны. На многих людей большое влияние оказал сам Дюран Дюран, особенно ваши видео. Это были одни из самых изящных и красивых видео. РТ: Знаю, знаю. Это невероятно. Наверно, можно приехать в любой отель мира, включить музыкальный канал и увидеть “Hungry Like A Wolf” или ещё что-нибудь. Невероятно. Мы никогда не осознавали важность этих маленьких клипов. Они были всего лишь новым инструментом продвижения. Мы не хотели становится кинозвёздами. Мы хотели быть музыкантами. Хотели писать песни. Хотели играть на концертах. Кто-то выдвинул идею снимать видео на месте, которая нам понравилась, но мы и понятия не имели, насколько это может быть важным. Мы очень благодарны за эти видео. Они превратили нас в мировых звёзд. Открыли для нас Америку, и это открытие было по-настоящему удачным для нас. МР: Даа, вы завоевали США, и не только в музыкальном смысле, но и в визуальном, также, впрочем, как и остальной мир. РТ: Даа, всегда нужно быть в правильном месте в подходящее время. Мы оказались в очень правильном месте. МТV только начинало своё вещание, оно было проведено в миллионы домов по всей Америке, а мы как раз были группой, которая выглядела и звучала как надо, делая вот эти маленькие видео. Если бы это случилось на пять лет раньше, кто знает… Многое было в нужном месте, в нужное время. Мы были очень открыты для новых идей. Существовало очень большое количество групп, которые отказывались снимать видео, потому что это было нерокэнрольно или не совсем то, что должна делать группа. А мы были открыты и это сработало. МР: Надо также добавить, что вы были молодая и симпатичная группа. РТ: У нас всегда было эстетическое качество, как мы говорим. Нужно быть хорошим музыкантом, чтобы быть участником группы, но также важно хорошо выглядеть, и это в конце концов сослужило нам хорошую службу, несмотря на то, что у нас был риск остаться группой для подростков, и мы думали: «Это действительно то, чем мы стремимся быть?». Опять же, это сослужило нам хорошую службу в конце концов. Благодаря этому нас заметили. Нас успокаивало то, что Битлз тоже прошли через эти «подростковые» вещи, но, в конце концов, были восприняты серьёзно и записали отличные альбомы. Мы частенько смотрели в сторону Битлз и говорили, что ничего страшного, ведь они тоже прошли через это, не потому что я хочу сравнить нас с Битлз, они настолько уникальная, настолько ошеломляющая группа. Но мы частенько утешали себя тем, что у они тоже были в шкуре группы для подростков. МР: И, конечно же, после периода «кумиров подростков» у вас появились ещё хиты, такие как “Come Undone” и “Ordinary World”, например. РТ: Точно, и мы пережили это. Мы существуем уже 30 лет и к нам относятся даже с бОльшим уважением, чем раньше. Сейчас мы получаем хорошие отзывы о наших концертах, раньше это не было. Жизнь хороша. МР: Дюран Дюран и группы вроде вашей на самом деле внесли огромный вклад в поп-культуру – музыка, видео, мода. И я думаю, что, в действительности, это вы раскрутили МТV, несмотря на то, что принято думать наоборот. РТ: Даа, не очень-то много видеоклипов было тогда. МР: Совсем немного, но вы задавали тон и всегда были на острие на протяжении многих лет, поэтому, я думаю, что ваш вклад в культурное наследие Америки и всего мира не так уж и мал. МР: Когда вы оглядываетесь на вашу карьеру и ваши песни, о чём вы думаете? РТ: Я думаю, мы ценим это. Было время, когда нам не нравилось, что мы стали знаменитыми, благодаря нашим видео. Мы возмущались, потому что хотели, чтобы нас воспринимали серьёзно как группу за нашу музыку, за наши песни. К счастью, время было к нам благосклонно. Песни выдержали проверку временем. Мы выступали в Италии, и там 10000 человек сходили с ума от нашей музыки и песен и от того, какие мы сейчас. Теперь мы понимаем, как это здорово, что те видео оказались столь важны. Сейчас мы полностью принимаем это, и это круто. МР: Роджер, она не вошла в альбом, но, если честно, моя самая любимая песня вашей группы – это “Save A Prayer” и видеоклип тоже. Это был прекрасный момент в карьере Дюран Дюран. РТ: “Save A Prayer”, вау. Мы играли в Вероне последний раз и вышли на бис с “Save A Prayer”, и реально не спели ни одного слова. Зрители пропели каждую ноту, каждое слово песни. Дааа, 30 лет спустя это всё ещё случается. Это и есть подтверждение силы таких песен. Дело не только в видео. Клипы – это замечательно, они цементируют песни в сознании людей, но мы писали и хорошие песни. Мы до сих пор играем их и то, что ты имеешь возможность включать в программу песни, которые написал – это просто невероятно. МР: Не обыгрывая названия, скажу, что “Save A Prayer” превращается в гимн, когда люди поют её. Помню, думал об этом несколько лет назад, когда вы играли её на концерте. РТ: На самом деле, она была как национальный гимн в Италии. Самые популярные песни там это: “Save A Prayer” и “Wild Boys”. Они почти являются частью культурной идентичности Италии. Фантастика. МР: Роджер, какой совет дадите начинающим исполнителям? РТ: Конечно же, сейчас я бы сказал что-нибудь другое. Нам повезло, когда мы начинали. Мы появились сразу после Битлз, Куин и Роллинг Стоунз, групп, у которых был огромный каталог музыки и многолетний опыт. Дэвид Боуи отличался. Куча денег вращалась в индустрии, поэтому контракты заключались со многими, и мы были одними из тех многих, кто подписал тогда контракт с EMI. В то время это была территория возможностей. Теперь всё сложнее. Совет только один: продолжайте работать. Работать упорно. И работать во всевозможных направлениях. Мой сын тоже в группе. Ещё он ди-джей, продюсер и занимается сведением. Думаю, нужна разноплановость и упорство в работе. МР: А также средства массовой информации. РТ: Да, средства массовой информации это ещё одно направление для проработки. МР: Даа, ты практически должен работать, как говорится в старой поговорке, как человек-оркестр. РТ: Точно. К сожалению, я думаю, это всё из-за нелегального скачивания. В индустрии не остаётся денег, чтобы вкладывать в новых исполнителей и выявлять таланты. Боюсь, это то, к чему привело нас незаконное скачивание, и это серьёзные времена для музыкальной индустрии. МР: Роджер, огромное спасибо что уделили нам своё время. РТ: Спасибо вам. Вы делаете очень важное дело.